Augmented Reality Conference :: International Portfolio :: PRO IT Service S.R.L. - Choose a professional and accessible service for your online image! I found Mihai online and thought his service was exactly what I needed, and it was. He was able to turn my photoshop design into a working website. Arconf.com is a movable type community conference Website for the Augmented Reality Conference that will take place in San Francisco, on April the 21st, 2010. I've been working with Lee Dryburgh for a couple of projects so far, mainly for this eComm Conference which took place both in the US and Europe. This time Lee wanted me to build from scratch another movable type community Website for his newest Conference called Augmented Reality. My business relationship with Lee works very well. We're both easy going people and are easily agreeing on the things to be done for each and every project we do. We seem to complement each other very well. 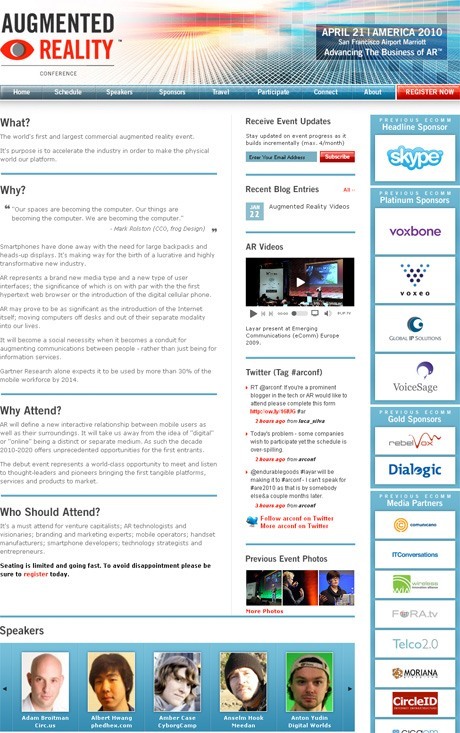 We've started on work on eComm for a few years now and we've continuously improved each and every conference Web site. Worth mentioning is that the eComm Conference takes place every spring in the United States. In 2009, apart from the spring event from the US, there was one in fall also in Europe. Lee's eComm conference grows every and this time he decided that he could leverage the 3rd day of the eComm conference as a separate conference called "Augmented Reality". People who attend the eComm conference would get the Augmented Reality sessions at no charge, but also people that want to attend only the Augmented Reality conference would get a sit cheaper than for the whole eComm Conference. So, from a technical point of view, this Augmented Reality conference is based on the 3rd day sessions from the eComm US Conference. When we've talked about building the Augmented Reality Conference website, we've decided that we should build up a completely new look and feel. We've also decided that it is time to consider using a couple of techniques for optimizing the site performances (such as for instance the loading time). Last, but not least, we've decided to implement a couple of features that we didn't implement on the eComm Conferences so far, such as the twitter stream and random flickr photos. Lee wanted to brand this 3rd day of his eComm US Conference as a separate entity called "Augmented Reality" and to suit this goal a completely new interface was needed. We thought that it was the right moment to not only pull a new design, but to also work on optimizing the website for loading faster. There are a couple of techniques for getting this done, and we've decided to put them all at work. This being said we've started to use CSS sprites whereby there is no individual graphic for each background, but common images which contain as many graphical items from the site as possible. Then, the exact positioning of a background component is controlled via CSS. We've also decided that we could cache most of the layout components so that the Website files won't be loaded for each and every page view, but loaded once and then pulled from the cache. Then, we've also decided to use gzip compression so that some of our Website interface would be compressed before being served to the visitor and automatically decompressed by his/hers local browser. These are just some of the techniques we've implemented to ensure that the Website is going to perform better for our visitors. 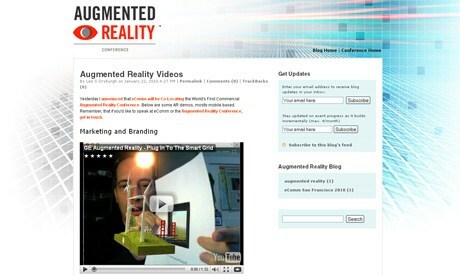 The Augmented Reality Conference Website is complemented by a blog where people could find blog posts on that topic, subscribe for blog updates via email, subscribe to a weekly newsletter, or perform searches on the keywords or key phrases they are interested into. Apart from all kind of improvements we've executed here and there, I would like to mention the "twitter stream" and the "random flickr photos". We've decided that a very effective way to keep our audience entertained is to display somewhere on our site the latest 3 actions from Twitter on the tag #arconf. Apart from syndicating the #arconf tag, we're also allowing our visitors to follow arconf, or to find out more about "arconf" on twitter. This is a nice feature meant to add some color to the conference website. Basically, we've automatically fetching images of the most recent eComm event (fall 2009 in Europe) and we've randomly displaying 3 images on each page load, with a link to the full size image, as well as a link called "More Photos" which brings the visitor to the Flickr page containing the eComm Europe 2009 footage. We've decided to switch from the movable type native commenting function to Disqus as it allows interaction with a few social networks. Furthermore, we've decided that we should do this, not only for the Augmented Reality Conference Website, but also to its blog, as well as the eComm 2010 US Conference Website and its blog. 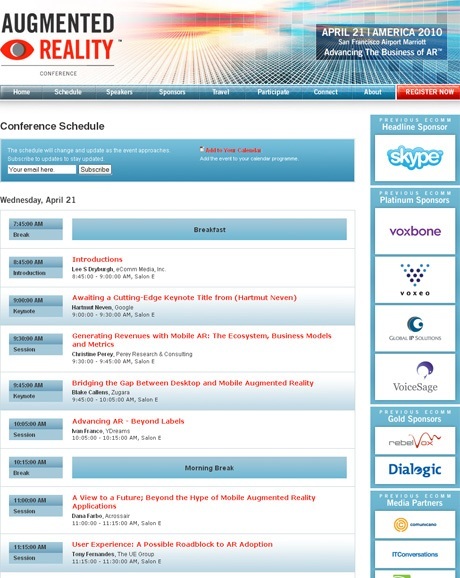 This page lists the conference schedule divided by event. Each event has a name, a starting time, an ending time, a speaker representing a specific company, a place where it happens and a specific type (like: break, introduction, keynote, session etc.). Each speaker has its own profile on the Conference Website, with name, company, role, photo, short bio, detailed bio and a list of sessions that he/she speaks at. There is a page called "speakers" which display all the speakers together, as well as an individual page for each speaker which contains the bio detailed version. Apart from the sponsors' listing from the sidebar which is divided by type into "headline sponsor", "platinum sponsor", "gold sponsors" and "media partners" and which displays only the sponsors logos linked to their corresponding Website, there is also a page called Sponsors. In this sponsors' page, we're listing some text details for each and every sponsor. There are also other sections like "Travel" with venue details and directions which include a google map. People could even get google directions using the google map application. There are also details about how to participate (as a sponsor, speaker, press or blogger), how to connect (blog, facebook, blog feed and twitter), about (general and contact) as well as a way for people to register which in fact integrated an amiando.com ticketing application within the Website look and feel. Contracting from eComm Media, Inc., California, U.S.A.